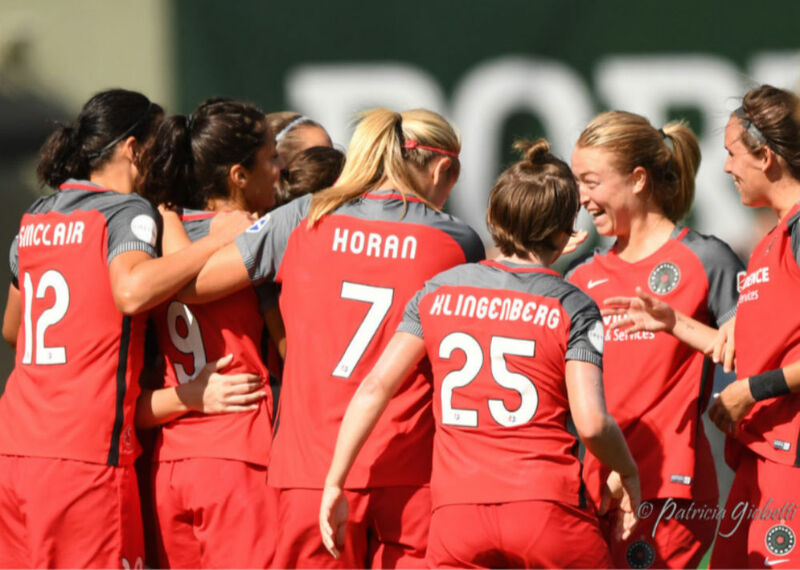 The Portland Thorns FC are headed back to the NWSL Championship match after defeating the Seattle Reign FC, 2-1, on Saturday at Providence Park. Jasmyne Spencer put the Reign on the board first, but goals by Tobin Heath and Lindsey Horan punched the reigning champions’ ticket to their third final. The match marked the first time the league’s biggest rivals faced off in postseason action, and the game did not disappoint as it was full of back-and-forth action between the two sides. The Reign dominated the majority of the first half, enjoying almost 60 percent of possession and outshooting the Thorns 13-8 in the opening 45 minutes. However, the two teams were level in shots on goal, with both teams putting five shots on frame in the first half. 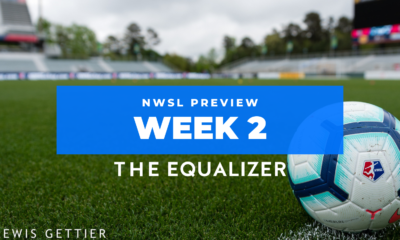 Three of those chances for Portland came in quick succession in the 18th minute, in a chaotic sequence that started with an Ellie Carpenter throw in and saw the likes of Caitlin Foord, Midge Purce, and Tobin Heath all gets looks on goal, only to denied time after time by Seattle goalkeeper Lydia Williams. Seattle got on the board just before the 30-minute mark following a hard challenge on Jess Fishlock by Emily Sonnett, which resulted in the defender being shown the first yellow of the match and Seattle being awarded a free kick in their final third. Megan Rapinoe sent in a bending shot toward goal with her free kick, but her shot deflected off the crossbar. The deflection fell to Spencer, who knocked the rebound past Adrianna Franch for the Seattle goal. 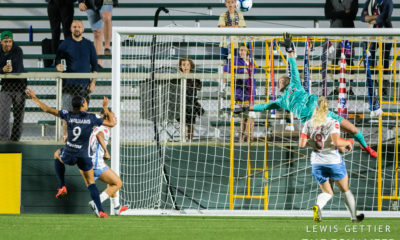 Following Spencer’s goal, Seattle’s Jodie Taylor had two solid chances to double the Reign’s lead, the first coming in the 33rd minute when she fired off a rocket from distance, only to be denied by an impressive save by Portland netminder Adrianna Franch. The England international nearly struck again moments later, turning on a dime inside the box to get off her shot, forcing Franch into an acrobatic save to once again deny the Reign forward. Seattle continued to carry the momentum until just before halftime, when a defensive miscue allowed Portland to pull back level. Foord won the ball in the air and dribbled around two Reign players before passing forward to Horan, who drew a number of defenders to her as she ran toward goal. Horan created a look on goal for herself but opted instead to play the ball diagonally to Heath, who had run unmarked inside the box. Heath took a couple of touches before firing a close-range shot past Williams for the equalizer shortly before the break. Portland entered the second half still riding the momentum of Heath’s equalizer, and it seemed to only be a matter of time before the Thorns took the lead. They looked to have done that in the 69th minute after Horan, Sinclair, and Heath all connected on a play that ended with Heath slotting the ball past Williams. The celebration was short-lived, though, as the assistant referee had raised the offside flag, negating Heath’s goal. The call was highly controversial as the replay showed Heath onside on the play. The Thorns were able to make up for the controversial non-goal less than 10 minutes later, courtesy of Horan. 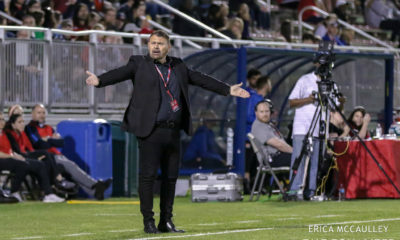 Portland maintained possession of the ball inside their attacking half despite heavy defensive pressure from Seattle that saw both Horan and Heath fall to the pitch following collisions with the opposition. 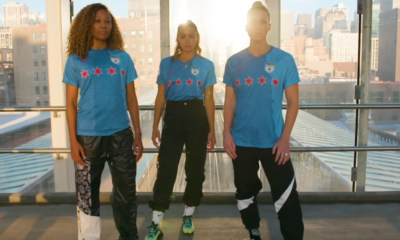 Even so, Horan was able to climb back to her feet in time to make a run toward goal for Sinclair, who played a lofted cross in from the far side. Horan got her head on Sinclair’s ball in and ping-ponged it off both posts before it rolled across the goal line for the game winning goal. That one counts. @ThornsFC up 2-1 with a goal from @Lindseyhoran11! 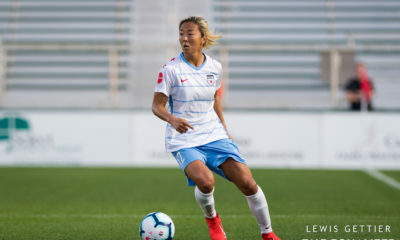 With the win Portland now advances to their third overall and second consecutive NWSL Championship where they will face the winner of Tuesday’s semifinal between the North Carolina Courage and the Chicago Red Stars. The NWSL final will be played on Saturday, September 22 at Providence Park in Portland.